Mules N' Honey: Knob Considerations, costs for a house, and me. I'm nutty. Knob Considerations, costs for a house, and me. I'm nutty. 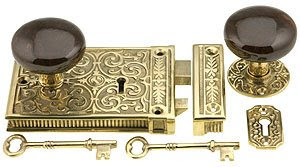 This is the style of lock set we are leaning towards right now- it's a rim lock something or other. Very easy to install. This is another consideration, but in an oil rubbed bronze finish. Boy are these things pricey. We don't even have walls yet... first things first though. And when does it stop- you get the cool door knobs AND the hinges? And the light switches? And the electrical outlets? (Which are funny because they didn't have electricity "back then".) So, after we actually have a house we will see about the fancy details. It's all about money, or lack thereof. We'll know just how much we have left for finishing details after the house is framed, sheathed, roofed,wired, plumbed, insulated, and drywalled. After all THOSE things, then comes the negotiable details. Like, you HAVE to spend a certain amount on drywall, because it costs what it costs. But flooring can run anywhere from 99 cents to 99 dollars a square foot. We plan on spending more for insulation because we really have some extreme temps here. Winters can be in the teens (two winters our lowest was 7... yuck) and summers are 100+ (last summer the highest was 114...yuck). So, the less heating and a/c we have to run, the better. It's all about being comfortable. Right now in the house building process from MY perspective, I'm in the "It'll be interesting to see how it all turns out" phase. I should document the phases, like the 5 stages of grief by E. Kubler-Ross. Except it'll be "Karrie Bunting's 5 stages of feelings while you develop land and build a house and have two pregnancies and two babies to add to your other two babies who you have to sometimes pull cactus pokies from their hands and legs and hope the mountain lions don't eat you when you are taking a walk around the "neighborhood" and how living in a trailer isn't that bad except when things start to break because RV's are really not meant for living in for over three years." or something like that. The newest trailer trial is the mystery of the almost non-flushing toilet. Water flow is low. Too low. Karrie, you are just so amazingly awesome, did you know that? Very fancy knobs! You always have great posts.